The moment a festival or a wedding ceremony arrives, everyone starts worrying about their trousseau. 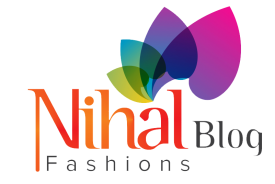 Women have loads of options in ethnic wear like sarees, lehengas, gowns, salwar kameez, kurtas, etc. but men have to brainstorm a bit to choose the right attire because of limited options. 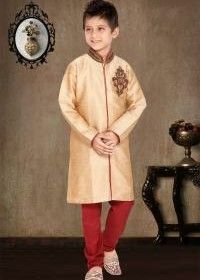 For men, kurta pajamas are the most comfortable traditional attires but a classy sherwani has its own charm. Sherwanis are usually worn by grooms but these days indo western sherwanis are worn by others too. 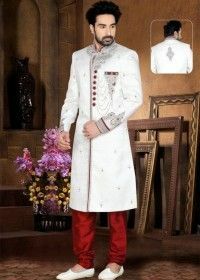 Sherwani is a long coat like attire which is worn with straight-fit trousers. Giving out a very royal feel, sherwanis are highly preferred by men. 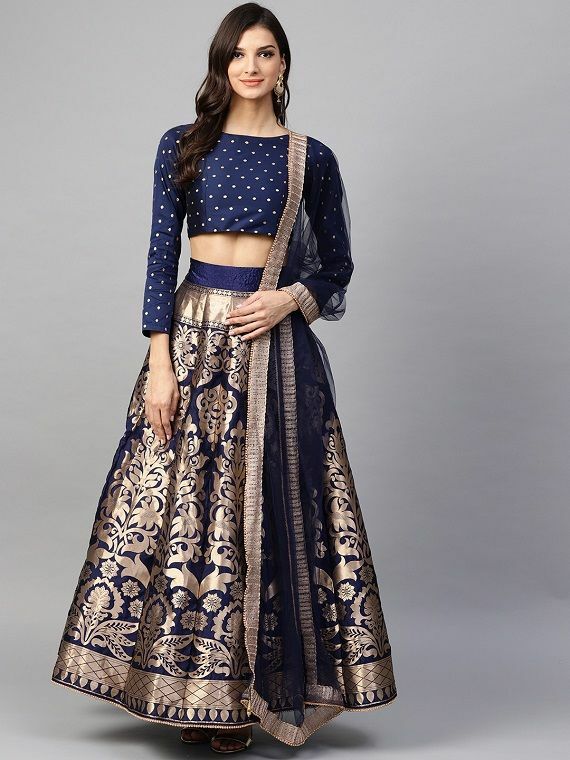 The wedding season and the festivals have no real ends and these attires make for a perfect outfit. Even weddings these days are full of glitz and glamour and they call for an up-to-date attire. Several Bollywood actors also swear by this attire because it defines their physique amazingly well as compared to other outfits. Earlier sherwanis used to be extremely traditional with nothing but embellishments but now they come in a variety of customizations. With new patterns, designs and colours, sherwanis have now transformed. If you are ready to experiment with your wardrobe a bit then you are going to be spoilt for choice with so many new styles. Here are some mens wedding sherwani trends to look out for this season. Bored of the mix and match trends? Try opting for a monotone sherwani. Monotone sherwanis are single coloured sherwanis wherein both the sherwani and the trousers are of the same colour. 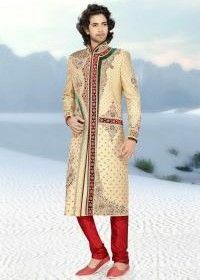 This kind of sherwani is not just classy looking but is also easy to carry. However, if you go for monotone the colour has to be selected very carefully. The colour selected should not be too dull but should make an impact. Try opting from the shades of blue, ivory, red, etc. A monotone wedding sherwani is perfect for grooms who don’t want to experiment much with contrasting shades. Pastels are not just for bridal lehengas anymore even grooms can don these amazing hues. Pastel coloured sherwanis work the best for summer weddings. Due to their light tone, they are easy on the eyes and also look elegant to the core. Moreover, the groom can also colour coordinate the shade with the bride’s lehenga. The trendiest pastel shades are pink, peach, pastel green, etc. Belts have made a huge comeback in ethnic fashion too. Sherwanis are also worn with belts nowadays. Usually, these belts are colour coordinated with the rest of the outfit and are made of a richer fabric which enhances the overall look of the outfit. Most of the times even the belt has some embroidery or work which makes it look traditional to the core. The ombre effect on a wedding sherwani looks extremely contemporary and stylish. If you want to wear something different and unique then go for an ombre sherwani. This look is perfect for a friend’s wedding ceremony where you don’t need to go overboard! Choose the shades correctly when opting for this style. Check out the pastel shades like lavender, pink, pastel green, etc. 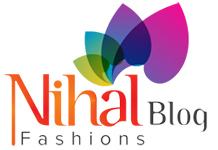 If you don’t want to visit numerous stores, you can also select your wedding sherwani online. Rather than going for embellishments you can also choose to go for quirky patterns. 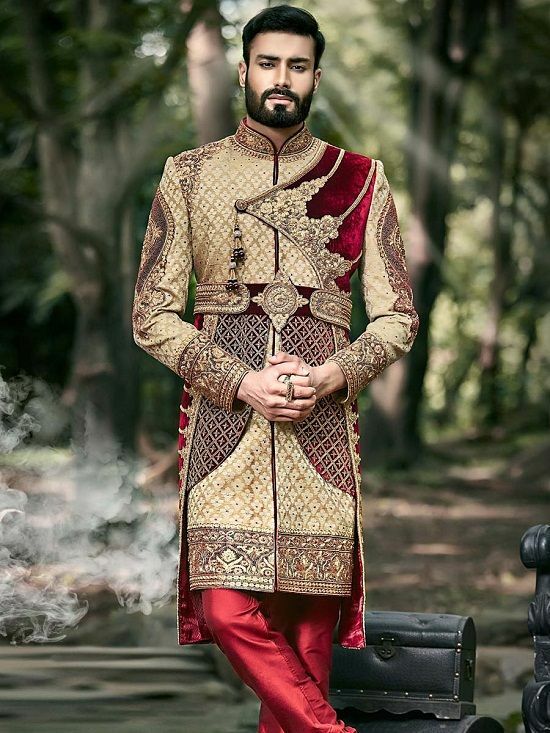 Check out the latest trends of wedding sherwani. Give monochrome designs a try if you are bored with bright colours and tones. The classic combination of black and white works well for all occasions. The combination of black, white and grey is perfect for evening occasions especially for a reception like event. Even in black and white, you can go for a variety of prints like florals, stripes, motifs etc. This colour combination is quite modern and casual. Above all, it is perfect for men who are not sure which other colours they can pull off. The trend of wearing florals is very much in vogue. Florals look the best in bright colours and are perfect for a day event. If you do not want to go for a full floral sherwani you can add a floral jacket to a plain and simple sherwani. You can opt for a blend of floral and geometric prints as well. Combine a floral jacket or a waistcoat with a cream or ivory coloured sherwani and you are bound to make a style statement. Almost every mens wedding sherwani comes with a colour coordinated dupatta. Drift away from the norm and team up your dark coloured sherwani with a white embroidered dupatta. A white dupatta not only looks extremely royal but also gives an elegant feel to the whole outfit. Moreover, adding a dupatta to this ethnic attire will enhance its traditionality to a large extent. One can match the white dupatta with the sherwani by adding a similar coloured border to the dupatta. Every sherwani is usually worn with a straight fit churidar but one can also opt for a traditional dhoti. Wear this combination for a wedding and you are good to go! Usually, a white dhoti goes on every sherwani but if you want to choose something heavy then you can also choose a gold-toned dhoti depending on the finish of the sherwani. Apart from the designs and the patterns, every designer sherwani for groom has to fit properly. In Indian outfits, the fit is of utmost importance because that decides the overall look. Make sure that your mens sherwani is fitting you properly and is not too tight or loose. Additionally, combine this elegant attire with a traditional pair of footwear like mojris. If you are tired of choosing the right sherwani for yourself offline then opt for a wedding sherwani online. Sherwanis online are not just easy on pocket but are also rich in quality.